Home Celeb Gossip Singer Weasel Manizo Fires Chagga, Hires Brian White As Manager! Singer Weasel Manizo Fires Chagga, Hires Brian White As Manager! Following the recent disagreements and clashes between Goodlife management and Brain White, Singer Weasel has come to put them tho an end by firing his manager Chagga and hiring Brian White. While appearing on National television, Weasel came out and wondered how inhuman his mager was. His argument was that Chagga was so money minded that he could not consider several factors to give Weasel time off! He adds that he is still grieving and probaly neede to get some time off, Brian White is footing the bills to finish off Mowzey Radio’s grave as well as Radio’s house for his mother but Chagga can afford to recieve money for bookings as well as speak ill about Brian White! Weasel Could not wait but fire the manager on tv! “As i speak Chagga you are fire” he said. Weasel is said to now be under Brian White foundation as a full time worker. 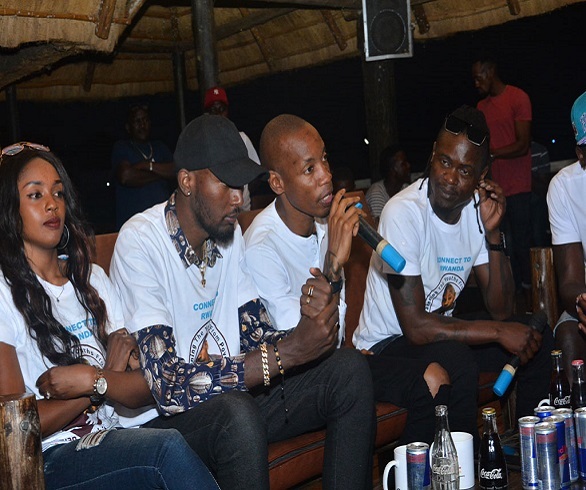 Flash Uganda media has come to learn that Chagga has already hit sudio in a bid to eep Mowzey Radio’s Record label, Angel Music alive. He jsut released a new son dubbed Nsasira under the record label. Previous articleMemorable Tugende mu kikadde returns for season two at Serena hotel. Next articleVictor Kamenyo The Barking Dog That Never Bites!